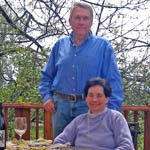 Contact Us: McKenzie Orchards Bed and Breakfast -- a modern B&B Inn on the McKenzie River near Eugene Oregon. We'll usually be able to answer between 7:00 am and 7:00 pm Pacific Time, but you can always leave a message. Or use the following form to send us a message directly. Please fill out all fields. Your email address will be kept strictly private! We do need an email address or a telephone number to respond back to you. To avoid spam, we must block any message which contains links to other web pages.